The Old Town are of Albuquerque is located just west of downtown a few blocks. It is where the city of Albuquerque first started over 300 years ago. Here you'll find parks, museums, older quiet residential streets, great restaurants and a beautiful hotel with nightlife. But at the heart of it all, is the historic Old Town Plaza, with lots of shopping surrounding the beloved gazebo and San Felipe de Neri church in the center. 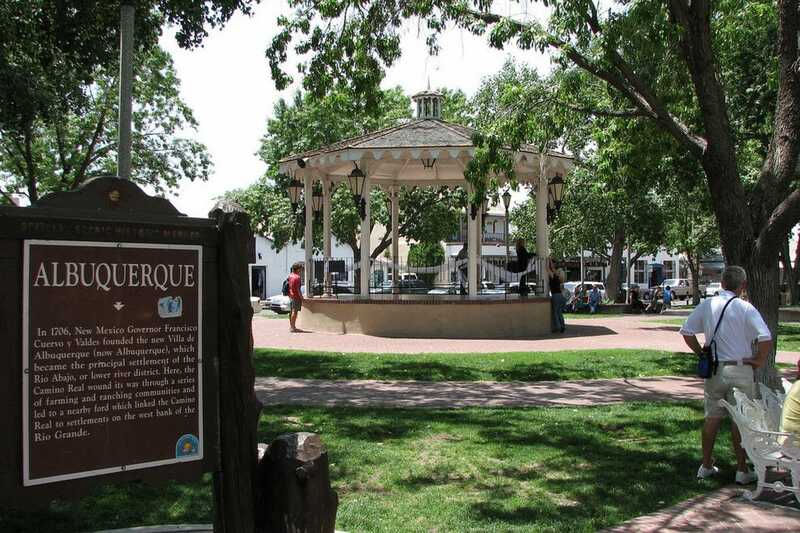 In the heart of Historic Old Town, is the Old Town Plaza, where Albuquerque started over 300 years ago. Here you'll find the historic San Felipe de Neri Church, dating back to 1793, surrounded by the charming gazebo, where numerous music and dance performances take place. Shopping, restaurants, souvenirs and culture can all be found in this quaint area - guided tours (even ghost tours) available. Within walking distance are the New Mexico Museum of Natural History with its Planetarium and IMAX theatre and the beautiful Albuquerque Museum, where outdoor musical concerts happen all summer in the sculpture garden. The state of New Mexico is known for having a cuisine all its own - that of New Mexican food, known for its main component - red and green chile! Dishes are inspired by combining Mexican and native Pueblo foods, using more vegetables, such as corn, and black beans instead of pinto. There are great choices for restaurants in the Old Town area, such as the charming Church Street Cafe, High Noon and more traditional fare at Seasons and Cristobal's. On the property of the beautiful Hotel Albuquerque, situated right next to historic Old Town Albuquerque, you'll find great nightlife in the Q Bar and Casa Essencia. The Q Bar is located right inside the hotel and offers posh seating and an adjoining room with live bands and dancing. Just outside in a separate building is the newer Casa Essencia, with its many different rooms to wander and dance in, with hip decor, and an outdoor patio. Cover charge is a little steep here. The Hotel Albuquerque at Old Town lies adjacent to the historic Old Town Plaza and is an elegant choice for enjoying your time in Albuquerque, NM. A beautiful location for events and weddings, it is a large high rise hotel with spectacular views on the east side of the Sandia Mountains. Southwestern elegance greets you at the Hotel Albuquerque. Several dining options are available, along with the Q Bar for nightlife, providing live music and dancing. If you've never been to New Mexico, or even if you're a local, it never gets old strolling the Old Town Plaza and perusing the wares of local artists, such as jewelers from nearby pueblos. Some natives even line the sidewalk outdoors and place their items on blankets to tempt you as you pass by. Fine art, pottery and jewelry can be found at Weems Gallery, Volere Gallery and Romero Street Gallery. There's plenty of souvenirs and southwestern clothing finds in Old Town.